Micrograph of a diffuse large B cell lymphoma. The following case report details the success of the El Gilani Methodology (EGM) as a treatment modality in a cancer patient. “NA” is a 66 year-old female with past medical history remarkable for Multiple Sclerosis (MS) diagnosed in 2001 via MRI studies of the brain and cervical spine. In the interim since her diagnosis of MS, she remained completely independent, highly functional and was under the regular care of a neurologist and her symptoms had been stable and well controlled for a number of years. In early 2015, she began to have unilateral symptoms of progressively worsening pain in her right hip and leg. As she did not notice any improvement with over-the-counter pain relievers/anti-inflammatories, she discussed with her healthcare provider having imaging studies performed. Beginning in April 2015, she had a series of imaging studies which included: MRI’s of her brain and cervical, thoracic and lumbar spine. Results showed extensive and widespread osseous metastatic disease including the skull, spine and pelvis. Liver and adrenal lesions were also noted, indicating the cancer had spread to these organs as well. Essentially, the imaging studies showed metastatic cancer which had spread to her bones, liver and adrenal glands. The abnormal MRI findings were followed by a multitude of other diagnostic studies, including CT chest-abdomen-pelvis, mammogram, and a host of laboratory tests. The goal was to determine the “primary” site of the cancer or to at least identify the type of cancer in order to direct therapy. After a radioactive tracer (FDG) was injected intravenously, a PET/CT scan in May 2015 showed extensive FDG avid osseous metastatic disease involving some bones, multiple lymph nodes in her abdomen, her left adrenal gland. This study confirmed the MRI findings, but did not localize the origin of the problem. After an extensive review of her lab work, the primary site of her malignancy remained indeterminate. 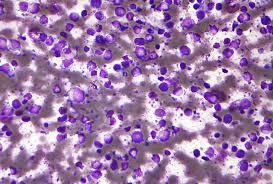 A bone marrow biopsy revealed the type of cancer: B cell lymphoma. Her oncologist at Duke University Medical Center offered chemotherapy as a treatment option. Hearing her physician discuss these results was quite disconcerting. One of her concerns was the potential adverse effects of chemotherapy. Often, the drugs are prescribed to treat a particular disorder cause side effects which can result in damage to other organs. The patient knew of the International Quranic Open University (IQOU), and contacted staff members of the Abdul Qadir Gilani Sufic Sciences Institute to discuss her case and to request alternative treatment options. She was immediately sent a specially-prepared ancient herbal remedy “Sumlu” and began taking this medication in the morning and evening for 30 days. “NA” was also given a spiritual prescription, specially enumerated by El Sheikh Syed Mubarik Gillani, which included powerful supplications and the recitation of very specific verses of the Holy Quran. She immediately began the daily program as instructed. The regimen was intense and included: saying “Bismillahir Rahmaanir Raheem” 12,000 times every Friday (friends and family were able to participate), morning and evening recitation of Surah Al-Fatiha 41 times over water, then blowing into and drinking the water. Instead of “Alhamdulillah” which is the beginning of the Surah, she was instructed to say “Milhamdulillah” for each recital. On Fridays, between the late afternoon and evening prayer, she recited “Ya Allahu Ya Rahmaanu Ya Raheemu” 3,125 times. Bearing witness to the Word of the Almighty, she maintained a reverence and firm belief in His power to heal. “NA’s” case is the latest example, preceded by numerous other documented examples, of the undeniable curative properties of the El Gilani Methodology.